15/10/08 — Acquisition — Amsterdam, Historisch Museum — The Historical Museum in Amsterdam has acquired a canvas by Jacob van Ruisdael representing A View of Amsterdam (ill.), seen from south of the city on the other side of the Amstel River, in honour of Pauline Kruseman, the establishment’s current director who will be retiring next January 1st. 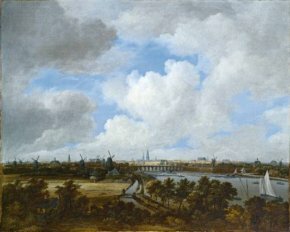 Another painting by Ruisdael, close to this one, is held at the Fitzwilliam Museum. Both date from the painter’s last years. The painting had been sold at Sotheby’s London on 6 December 2006 for £1,688,000 (including charges).